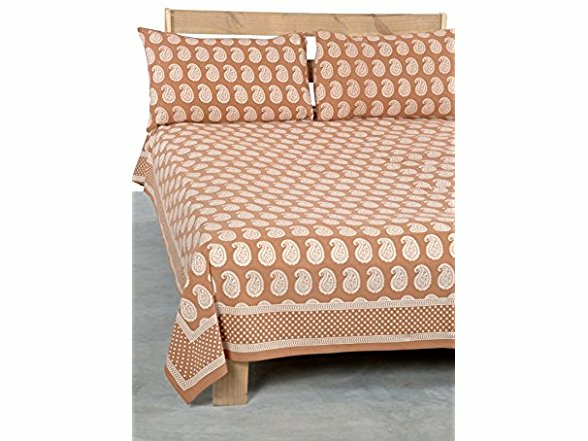 This is a screen printed bedding set, completely handmade. This can be used as a bedspread, beach sheet or even as a throw. It adds a lot of color in any given room and spreads a very positive and joyous vibe. It's an art piece, a collector's item and provides a rich and vibrant feel. It's made of 100% cotton and the colors used are also natural. The process isn't hazardous to anyone who works in making this and thus it is very sustainable. The imperfections in this piece such as size variation, color variation and a little miss print give it a very authentic look and feel and portray its true handmade nature. Exclusive product with brand packaging. Unauthorized sellers will face indefinite ban. We have few authorized re sellers whom we give rights for selling on Amazon with proper brand packaging. If the product reaches you without the packaging report to Amazon immediately with pictures of the product.